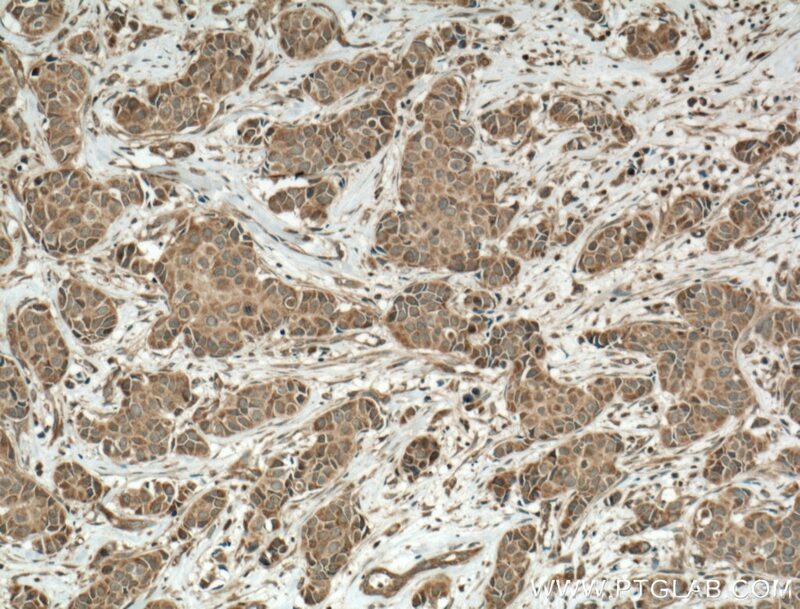 Immunohistochemical analysis of paraffin-embedded human breast cancer tissue slide using 11594-1-AP( ACP5 Antibody) at dilution of 1:200 (under 10x lens). 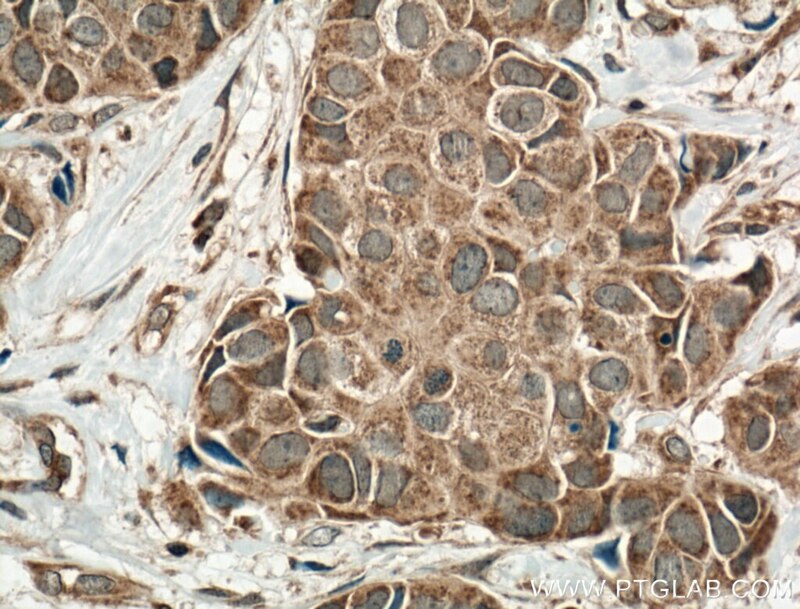 Immunohistochemical analysis of paraffin-embedded human breast cancer tissue slide using 11594-1-AP( ACP5 Antibody) at dilution of 1:200 (under 40x lens). ACP5(acid phosphatase 5, tartrate resistant) is also named as TRAP, TrATPase and belongs to the metallophosphoesterase superfamily. It is an iron-containing glycoprotein with a molecular mass of approximately 34 kD. ACP5 is a histochemical marker of the osteoclast. It is also characteristic of monohistiocytes, particularly alveolar macrophages, and is associated with diverse pathological conditions, including hairy cell leukemia and AIDS encephalopathy.(PMID:10639488). Secreted Klotho Attenuates Inflammation-Associated Aortic Valve Fibrosis in Senescence-Accelerated Mice P1. (2R,3R)Dihydromyricetin inhibits osteoclastogenesis and bone loss through scavenging LPS-induced oxidative stress and NF-κB and MAPKs pathways activating. Effects of Taxifolin on Osteoclastogenesis in vitro and in vivo. Hesperetin suppresses RANKL-induced osteoclastogenesis and ameliorates lipopolysaccharide-induced bone loss.